Jim Fennell grew up in the Westminster Ridge neighborhood of White Plains. Early on he attended the City’s public schools, then later graduated from Archbishop Stepinac High School. He has a BBA in general business management from the University of Miami and recently earned an MBA from Penn State University with concentrations in management and corporate strategy. A marketing executive with broad experience in program development, print production and execution, Jim has worked on many well-known national brands over the course of his career. Today he is managing partner of ImpressionsDP, a tactical marketing agency that helps clients effectively execute programs in both digital and print media. He and his wife Laura still live in “The Ridge”, where they’ve raised their five children, James, Victoria, Kevin, Conor and Patrick. An active sports lover, you’ll often see Jim running around town in his POC shirt or driving with a kayak on the roof. 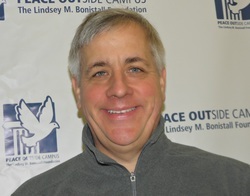 Jim has been involved with PEACE OUTside Campus, The Lindsey M. Bonistall Foundation since its early days. Living in Westminister Ridge, his family has been friends of the Bonistall family for many years. In fact, Lindsey was a favorite babysitter of the Fennell kids because she always brought along something fun for them to do. After Lindsey’s passing, Jim got involved in the first Lindsey Run, which was held at Court Sports in Elmsford. In January 2008, he joined the board of Directors as Director of Marketing, where he put his marketing expertise to good use. He developed the Foundation’s first communications plan, which encouraged the use of social media and other digital channels. More recently, he spearheaded an update of the Foundation’s brand including updating the mission statement, a new logo and high quality communications materials. In 2014, Jim was asked to join the Executive Committee as Treasurer; he accepted and we are very glad he did!